The MT700 has been redesigned and reengineered from the inside out. Enhanced with Challenger’s AccuEngineering™ platform, it is efficient and the most technologically advanced tracked tractor out there. 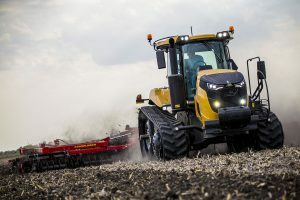 Three available models range from 380 to 431 horsepower and contain an AGCO 9.8L Diesel engine. Under the hood is a continuously variable transmission; improving fuel efficiency, pulling power and performance. The CVT works effectively with the Accu-Drive powertrain by delivering high torque at low engine speeds. The new cooling system has its own hydrostatic drive and features a reversible fan. Challenger’s advanced hydraulic system allows you to operate multiple implements efficiently- saving on fuel consumption and engine wear. Models are available with either a 58 or 113 (twin) GPM hydraulic system. 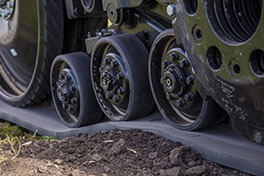 The remodeled track system delivers power to the ground using a tri-oscillation bogie system with larger midwheels. This results in semi-suspended double action, delivering constant contact to the ground, allowing the operator to maneuver rough terrain seamlessly while reducing pressure and compaction. The enhanced two-point cab suspension system features rugged coil springs and upgraded shock absorbers. The track system has a longer wheel base, with the hardbar positioned further forward- improving operator comfort substantially. The inside of the cab is no exception when it comes to the MT700’s improvements. The leg-room is optimal, the technology is top-notch and the functionality is exceptional. It is no surprise the MT700 is considered the most technologically advanced tracked tractor on the market.